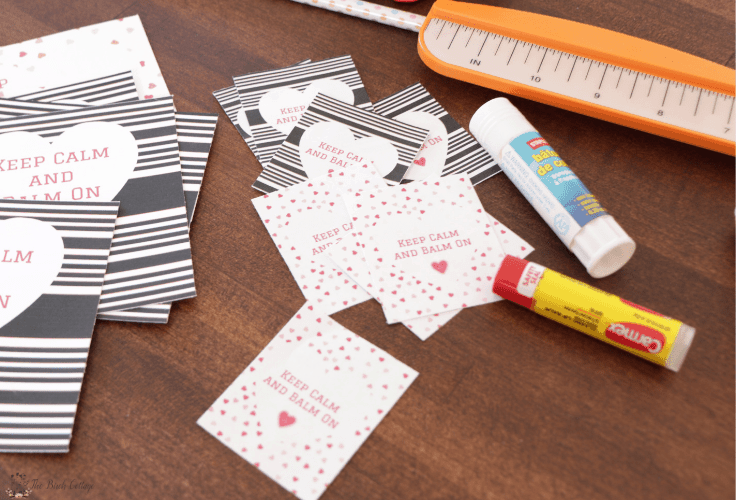 Learn how to make these adorable Keep Calm and Balm On free printable lip balm Valentines and Label Wrappers for a non-candy Valentine’s Day treat. Hello, Kenarry readers! 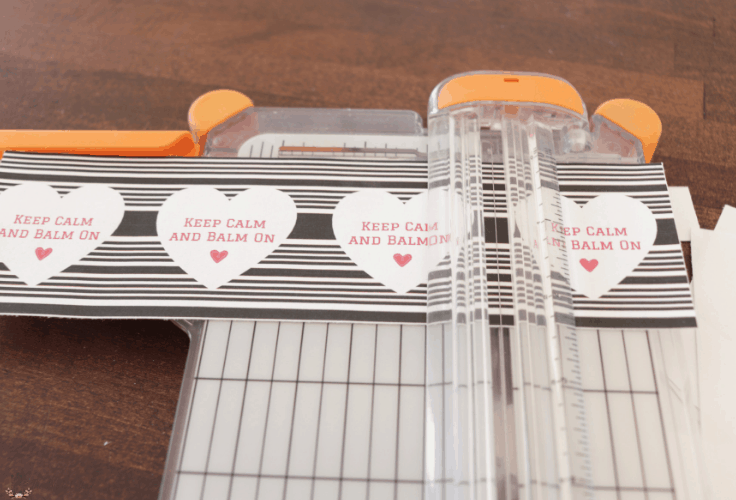 I’m Pam from The Birch Cottage, and I’m back again this month sharing with you these adorable (if I do say so myself) Keep Calm and Balm On Free Printable Lip Balm Valentines and Label Wrappers. Today’s inspiration was brought to you by my grandson. His parents were gracious enough to share him with us over Christmas break this year. We had a great time visiting with him, laughing with him and just really savored every moment of his visit. Our grandson lives in Florida. We live in Ohio. It’s cold in Ohio in the winter. Go figure! Our grandson has a habit of licking his lips. Do you know what happens when you lick your lips a lot while outdoors in the cold? I’m sure you guessed. So, we had to make an emergency stop at the pharmacy for some lip balm to try to ease the discomfort from his chapped lips. How old’s my grandson, you ask. He is 16 and has always licked his lips. You might say he’s a lip licker. 🙂 (I know, I know, not funny! But, I think I’m pretty funny!) But, I adore him anyway! Besides, you get to thank him for today’s Keep Calm and Balm On Lip Balm Valentines and Label Wrappers. These Lip Balm Valentines and Lip Balm Label Wrappers couldn’t be easier to make. 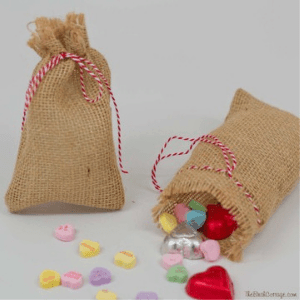 Plus, they make for a fun, candy-free Valentine treat for your children to share with their school friends. 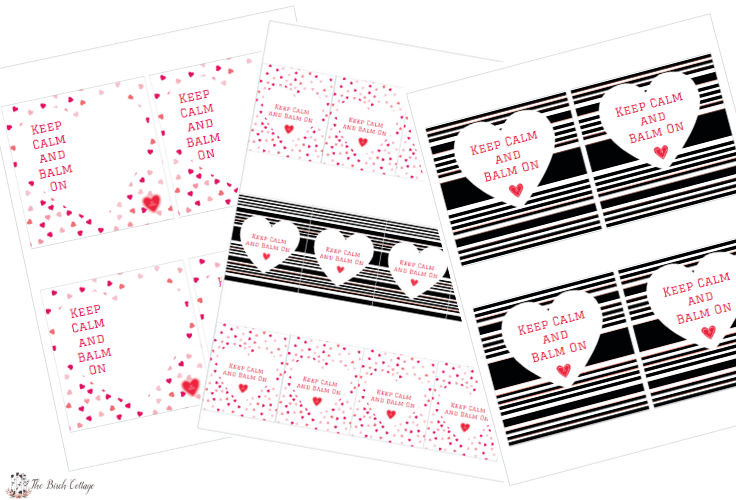 In fact, you can print out just the Valentines or just the Label Wrappers or both; the choice is yours! 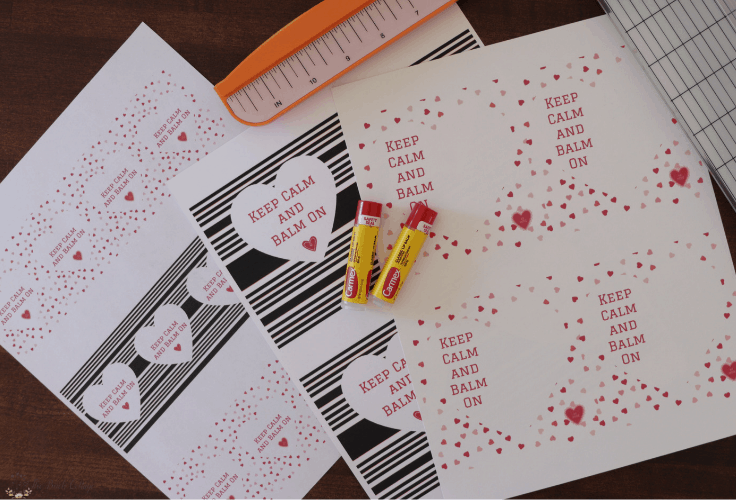 There are just a few supplies you’ll need to make these free printable Keep Calm and Balm On Lip Balm Valentines and Wrappers. Let’s take a look. 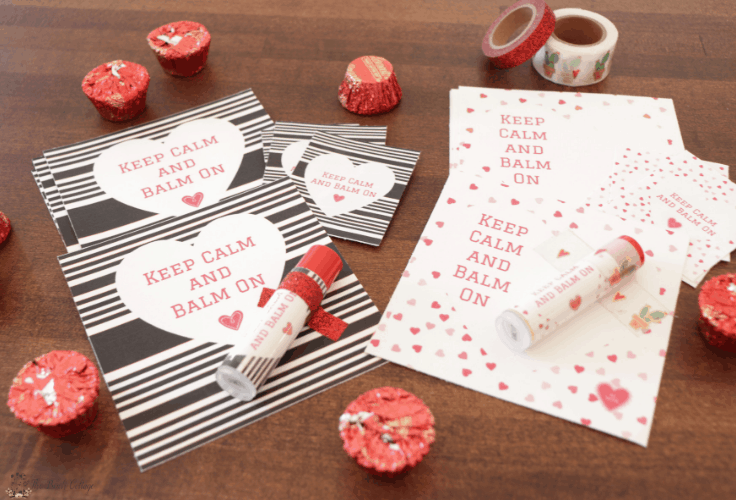 The first thing you’ll need is a copy of the printable Keep Calm and Balm on Lip Balm Valentines and Lip Balm Wrappers, which just so happen to be available as a FREE gift when you sign up below! Then you just need to download the PDF file and save it to your computer. 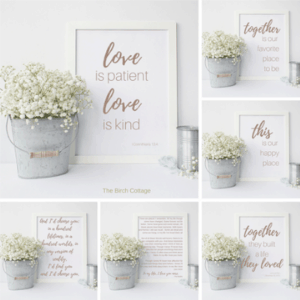 These Balm On Valentines and all other free printables from Ideas for the Home by Kenarry™ are for your own PERSONAL USE ONLY. Once you have the file, print the Lip Balm Valentines and/or Lip Balm Wrappers in color on white card stock. Print Actual Size or 100% Scale. Be sure the “Fit to Page” is not checked. 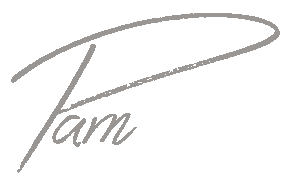 For laser printers, select Print using system dialog and use printing Properties or Preferences to change the Paper or Media Type to Cardstock. Select the correct Paper Size and print a test sheet on plain paper first. 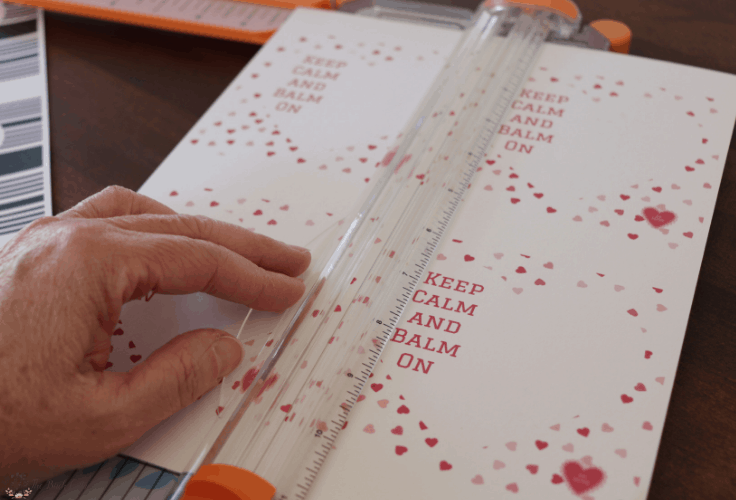 Once you print out the Valentines and Wrappers, you’ll want to cut them apart. For straight lines, I’d suggest using a paper trimmer. It’s so fast and much easier than using scissors. Using your glue stick, apply a generous amount of glue to the back side of the wrapper. I like to apply it to the top, that way the bottom is tucked inside the top of the wrapper. To protect the paper wrapper, you can also wrap it with packaging tape. This will also keep the Washi tape from adhering to the wrapper, if you decide to attach it to the Valentine card. If your child is able to write, have your child spell out his or her name on the back of the Balm On Valentines. 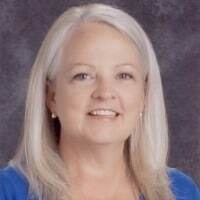 Be sure to check with your child’s teacher. Some teachers prefer that the Valentines not be addressed to specific students. It makes the Valentine distribution go so much easier! Now you’re ready to affix the lip balm to the Valentine. Simply tear off a piece of Washi tape (or use glue) and use to attach the lip balm to the Valentine.